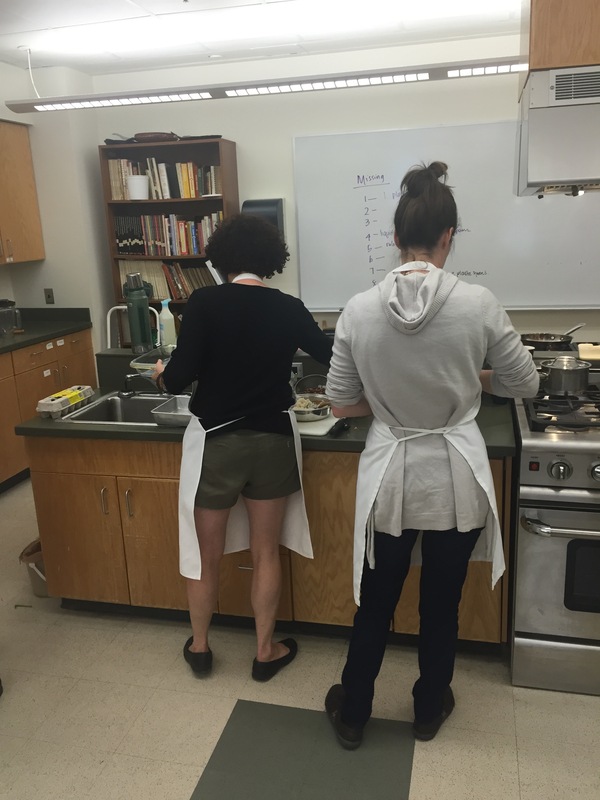 Last week, I had the opportunity to attend the John Dewey Kitchen Institute at the University of Vermont. The goal of this three-day workshop was to “emphasize experiential education, of course in teaching about food but also as an important pedagogical approach for teaching any subject.” As a long-time believer and practitioner of hands-on learning, I was eager to hone skills and think more about how to create opportunities for experiential learning in my anthropology of food classes. 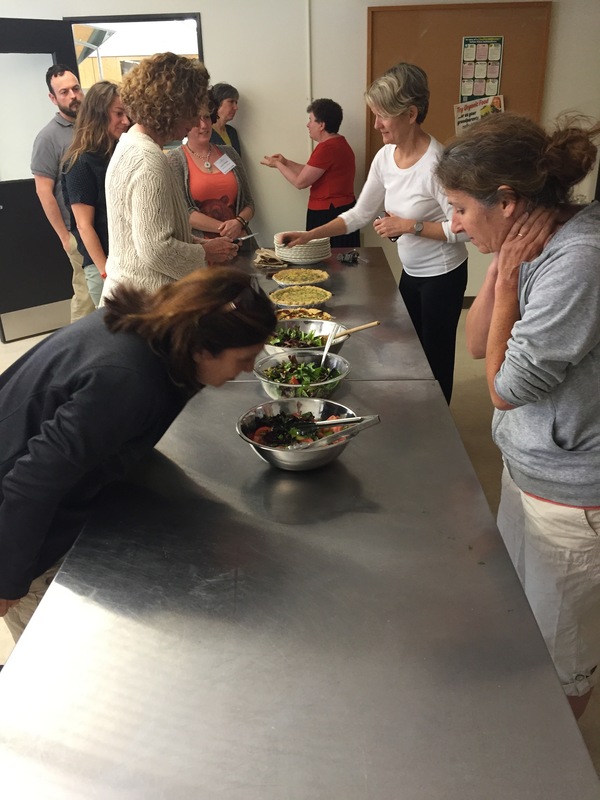 Using all our senses to think about lunch at the Dewey Kitchen Institute. A diagram of mise en place. 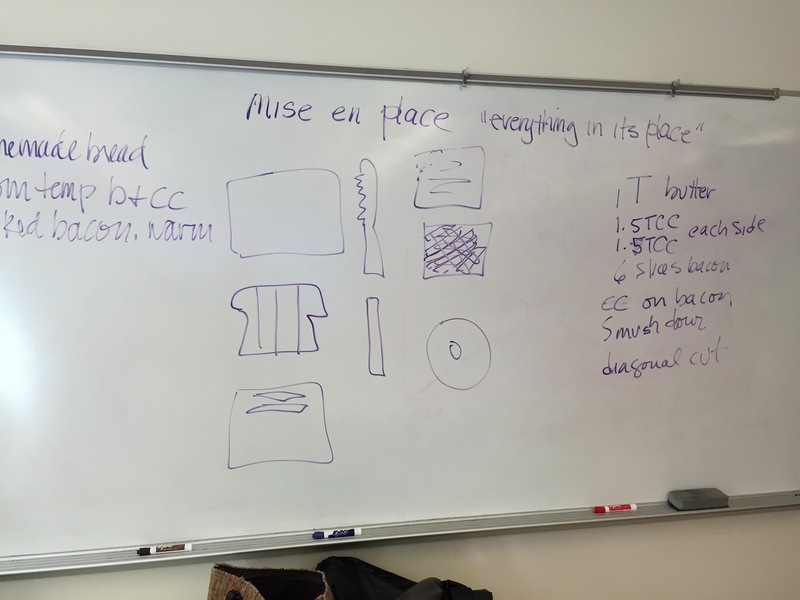 The next day we discussed the concept of mise en place and how this type of kitchen organization task might be used to get students to think about planning and organization in new ways. As we drew out our mise en place, I began to think about the spatial relationships between sensory experiences. That was a new dimension for me. I never really gave much thought to where I put my ingredients and why. After some reflection, we began to prepare lunch. This was an activity that not only fed us but taught us to think about divisions of labor and timing in the kitchen. This activity could be seen as an exercise in “education as a practice of democracy”. Having to organize ourselves and work together put this tenet in to action. I began to think about all the applications for such skills beyond the kitchen. On the last day, we were given a market basket and asked to cook lunch in teams. We were told that our dish had to embody one of the Dewey tenets. This was a challenging culinary and organizational task. My partner and I focused on “chance and change.” Although we ultimately produced some tasty poached eggs on toast with a romesco sauce, we felt that the experience was mediated by this tenet: we did not know what we would get for ingredients, what would happen in the cooking process, and we felt the need to adapt to the unexpected. As an anthropologist, I kept thinking about the ways I could introduce cultural diversity in to these exercises. While Dewey’s philosophy is second nature to most of us who do fieldwork, this workshop was an opportunity to bring the worlds of food studies and anthropology together. As I prepare my courses for the fall semester, I will be thinking of ways to bring experiential learning scenarios in to my anthropology of food courses.